This colourful whip (made in the Swedish nation´s colours) was used to punish disobedient sailors. The punishment was administered to the buttocks with pants up, therefore such a heavy whip was used. It is around 100 years old and must have been applied to many victims, due to the frayed end... Ecxept the fringe and a decorational "disc" around the knob, it has no leather parts. The strong handle is covered with white silk, decorated with red silken mesh. 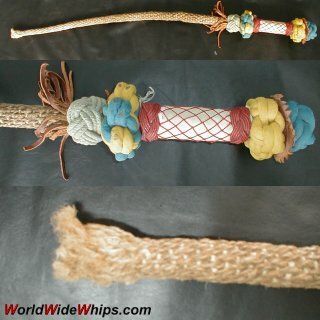 The whip´s body is tapered rope covered with hemp macramé.